The national count of Mass attendance across Australia will commence at the end of this month, the Australian Catholic Bishops Conference, Pastoral Research Office announced today. The first weekend in May, Saturday 30 April and Sunday 1 May 2016, will see the commencement of the national count of attendance. The count was first held in 2001. This will be the fourth time that the Australian Catholic Bishops Conference (ACBC) has conducted the count at a national level. The Count consists of a simple headcount of all attenders of all ages in all parishes and other Mass centres throughout Australia over the first four weekends in May. The count will only be conducted at the Sunday mass or the Saturday evening equivalent. The information collected, in addition to the number of people in attendance, includes the language and frequency of celebration. The Count is conducted both for Masses and Sunday assemblies in the absence of a priest. According to the most recent national count conducted in 2011, about 12.2 per cent of Australia’s Catholic population, or 662,000 people, attended Mass on a typical weekend. Most of those attended Mass in a parish, but the figure also included people attending Mass in non-parish centres, such as migrant centres, hospitals, gaols and boarding schools. 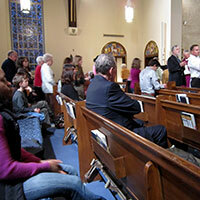 Some who were not attending Mass were present at a Sunday Assembly in the absence of a priest. As with previous counts, the 2016 national count of attendance will be conducted electronically, and most parishes will submit their counts online, rather than using paper forms. Any queries regarding the ACBC National Count of Attendance can be directed to the Pastoral Research Office on (03) 9953 3457 or by email: s.reid@pro.catholic.org.au. This entry was posted in Press Releases and tagged Mass, Mass attendance, Parish, Parishioners on April 29, 2016 by ACBC Communications.